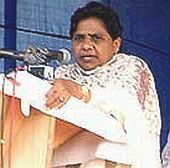 Uttar Pradesh Chief Minister Mayawati on Thursday announced a new land acquisition policy, which stresses that approval of any development project in the private sector would depend upon the consent of at least 70 per cent of the affected farmers. Besides, the private developers would directly deal with farmers for compensation, while the state would only play the role of a facilitator and notify both the parties about the acquisition of the designated land. The government has clarified that the new policy has been implemented with prospective effect and does not cover earlier projects for which land acquisition had already taken place. While the new policy promises added benefits to farmers, it revises some provision in the earlier land acquisition and rehabilitation policy announced on September 3, 2010. Apart from the land compensation rates to be fixed after consultation process, the affected farmer would now get Rs. 23,000 annuity per year per acre for the next 33 years and the annuity would increase by Rs. 800 every year. In the earlier policy, this amount was Rs. 20,000 and Rs. 600, respectively. If the farmer does not wish to avail of the annuity facility, he could seek one-time compensation of Rs. 276,000 per acre. Unveiling the new policy at a news conference here, Mayawati said her Bahujan Samaj Party would urge the Centre to enact a new national land acquisition policy during the forthcoming monsoon session of Parliament. She announced the new state policy was based on 'karar niyamavali' (policy agreement) and had been divided into three parts. The first part deals with land to be acquired for basic infrastructure such as highways and canal. This would be based on 'karar niyamavali' process and the farmers would be given all the benefits mentioned in the earlier 2010 policy. authorities, which prepare master plan for planned development. Under this part, 'karar niyamavali' would guide the land acquisition process and allow for all the benefits announced in the earlier policy. Now, it would also entitle the farmers to get 16 per cent of the developed land for free. If the farmer does not intend to keep the land or part of the 16 per cent developed land, he could liquidate a part of it for cash. The third part deals with land acquisition for development and other commercial purposes by private developers. The developers would take the land directly from farmers and fix compensation rates. But, at least 70 per cent of the farmers should approve the land deal for the project to take off. The private developer also needs to give 16 per cent of the developed land to farmers, while the latter can liquidate a part of it in return of cash. The farmers would be exempt from paying stamp/registration duty for the 16 per cent land. The farmer could also buy agricultural land in Uttar Pradesh within one year of the land deal without paying any stamp duty. Meanwhile, Mayawati on Thursday met farmers representatives at a 'kisan panchayat'. She said constructive suggestions emanating from this meeting would be incorporated in the Government Order for the new policy. The government has been forced to announce the new policy owing to vociferous farmers' protest in recent weeks over land acquisition issues. Recently, there had been farmers' protests in Noida/Greater Noida and Chandauli, besides sporadic agitations over land acquisition issues. Last month, farmers' agitation at Bhatta and Parsaul villages in Gautam Budh Nagar district (Greater Noida) had turned ugly, where two farmers and as many cops, had lost their lives in a bloody clash. Recently, Allahabad High Court had scrapped acquisition of several hundred hectares of land acquired in Noida over separate farmers' petitions.